BentoLunch.net - What's for lunch at our house: Preschool Snack Bento #28 - We've got watermelon! 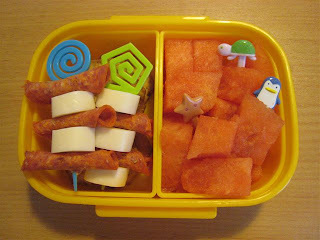 Preschool Snack Bento #28 - We've got watermelon! This is actually our one & only bento snack for the week. Want to know why? It's all here. Ben's actually been with my ILs most of the week, so Grandma took him to preschool on Wednesday and it snowed in Dallas on Thursday. Needless to say, both kids have been wanting watermelon all winter. I thought it was rather pricey until this week, so when I found it on sale, we got some! Ben had an entire half side of his bento with just watermelon, then the other side has a couple of pepperoni & cheese kebabs and some veggie crackers underneath. Love your blog! Thank you for sharing such fun, creative ideas for lunch for the kids. What a labor of love. Quick question...are all your lunches designed to be eaten at room temp? We don't have access to heating things up for the kids at school so just wondering how that affects what you pack. PS...did you enjoy the snow. I'm a local here in Dallas too! love the pepperoni & cheese skewers! great idea! love your blog too! Everything is pretty much room temp. With Ben this year, he goes to an afternoon preschool, so I leave my house around 12:30, school starts at 1 and I pick him up by 3:30. Most things don't have time to really get warm if they are cool and if I put foil around warm food, it lasts for the hour or two. Last year, Faith went to the school I taught at, so I cheated and packed her whatever and warmed up her food on campus. She went to lunch just as my kids were coming back from recess, so I'd duck into our faculty area, nuke her food for 30 seconds while she waited or had one of my sweet, responsible girls run it down to her.